The Vegetarian Experience: Book Review: The Quorn Kitchen. After years of adapting and making up my own recipes using the Quorn brand of products, the arrival of The Quorn Kitchen recipe book was a very exciting moment for me, as I finally had in my possession, a recipe book from which I could eat every single one of the recipes inside. By collecting my 2 tokens from the back of packets of Quorn, and paying £2.99, my copy of The Quorn Kitchen arrived at the end of January this year. The Quorn brand is made from a healthy protein called mycoprotein which is a member of the fungi family. It is low in fat, saturates and calories, cholesterol free and has no trans-fat at all. It is not just a product for vegetarians. It’s great for those who wish to follow a low-fat healthy diet and ideal for those with health problems who need to cut down on their meat consumption, as they can still eat the same dishes, but with Quorn substituted. 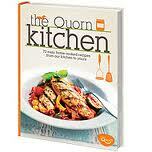 The Quorn Kitchen contains a wide range of 70 recipes using most of the Quorn range. There are also some beautiful mouth-watering full-page pictures to whet your appetite. I was especially interested to see recipes from a wide variety of countries as I have tended to stick to staples such as bolognese and lasagne in the past. · Tastes of Italy including carbonara, pizza, Italian balls, and risotto. · Asian-style dishes including noodles, thai salad, green curry, korma and tikka masala. After doing a brilliant effort and serving them up on a bed of salad, we decided that they would taste more yummy if coated in breadcrumbs first and that a jar of salsa would be a better choice than fresh salsa as it didn't cook amazingly well. This is the only dish I have found I would defer from the recipe book for. Other recipes I have cooked from this book are the spaghetti bolognese which is a weekly staple in our house as the kids love it. Also, the Chilli con Quorn, Quorn Lasagne, Quorn balls in tomato sauce and the Quorn Streak Supper in a flash, which is a wonderfully warm and hearty meal on a cold winter’s day. With the summer coming, I plan to try the sticky sausage skewers on the BBQ and the Thai salad on a warm evening. When I am feeling brave, I shall attempt the Quorn Korma or may be the Byriani for my hubby. I have cooked various Quorn recipes from this book whilst entertaining and the meat-eaters can rarely tell the difference and are often impressed that Quorn recipes are so tasty. As I said at the start, it is hard to find a recipe book for vegetarians where you can cook and eat every single recipe featured and so this book makes a refreshing change. I love that when I need to cook dinner for the family quickly, I am able to pick it up and cook straight from it rather than working out how to adapt meat recipes to make them vegetarian. Sounds good. I tend to stick to bolognaise and chilli when cooking with Quorn so a bit of variation might be nice.